Updated on October 11, 2017. A Burlington activist said he used graffiti Monday to make a political statement about a mural off Church Street. The goal? 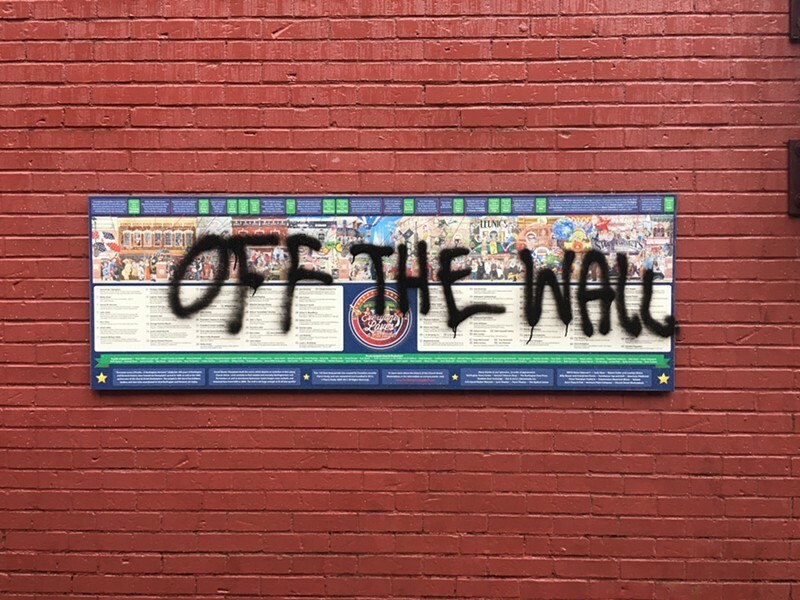 “To reset the debate on why an undeniably racist piece of ‘art’ and ‘history’ occupies our town square,” wrote Petrarca, an activist who is outspoken on a variety of Burlington issues. 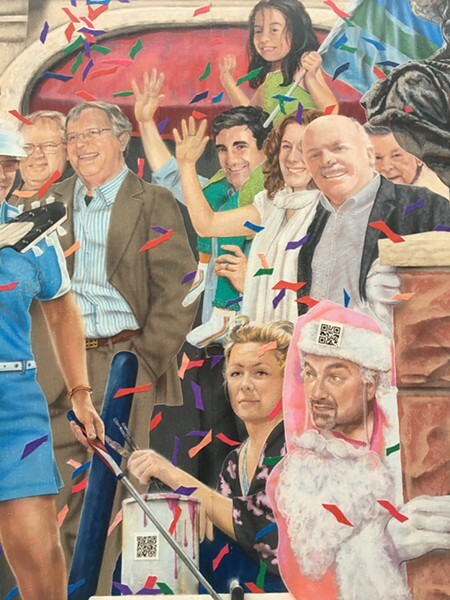 “Colorful and hyperrealistic,” Seven Days reported in 2012, “the mural unspools an eclectic cast of major and minor Vermont celebrities.” It’s located on the side of a building that houses Banana Republic along the pedestrian-only Leahy Way, which leads to the Marketplace parking garage. 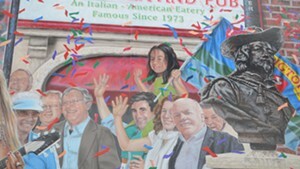 And yes, for those wondering, Sen. Patrick Leahy (D-Vt.) is also depicted in the mural. It also includes Burlington Mayor Miro Weinberger, who is seen waving to the parade-loving crowd with his daughter, Li Lin, sitting astride his shoulders and his wife, Stacy, standing at his side. The city appreciates the outreach regarding this public art. The city is deeply committed [to] inclusion and diversity, and I have directed Ron Redmond to review the issues raised by today’s protest and provide a report and recommendations within 30 days. While I appreciate the hard work and private resources that went into creating the mural, the issues raised today deserve careful review. Redmond is the executive director of the Church Street marketplace, which commissioned the work. The timing of the defacement appears not to be a coincidence. Columbus Day, declared by Governor Phil Scott as Indigenous Peoples’ Day in Vermont, has long been controversial for its whitewashing of the explorer Christopher Columbus’ disastrous impact on the natives in the Americas. Statues around the country dedicated to Columbus have been defaced as the holiday neared. Petrarca later called police to report what he'd done, Deputy Chief Shawn Burke said Wednesday in a press release. Surveillance video footage showed Petrarca, alone, writing “Off the Wall” in spray paint, Burke reported. Petrarca was cited for unlawful mischief, according to Burke. 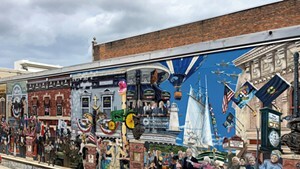 The Church Street Marketplace commissioned the mural in 2009 and it was completed in 2012, according to Redmond. 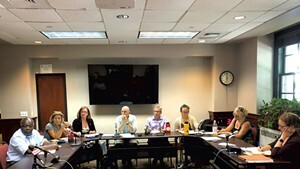 The $100,000 project, privately funded, was intended to celebrate the quadricentennial of Samuel de Champlain’s 1609 discovery of Lake Champlain. It includes Vermonty figures such as Trey Anastasio, Sen. Bernie Sanders (I-Vt.), Grace Potter, John Deere, Madeleine Kunin and Maria von Trapp. There are also nonVermonters, such as Elvis Presley and Abraham Lincoln. A likeness of actor Edward James Olmos, who is also not a Vermonter, makes an improbable appearance, as Seven Days reported in 2016. 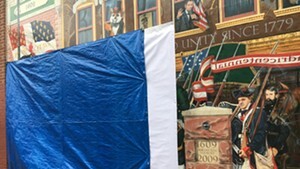 Featured businesses, including Ben & Jerry’s, Sweetwaters and Hotel Vermont, paid sponsorships and the mural includes their logo or storefront. Before he finished the project, Québec artist Pierre Hardy* made several additions, including Weinberger, who’d been elected mayor just months before the mural’s August 2012 unveiling. “We asked him if he wanted to be included. We just felt that was a nice thing to do,” said Redmond, noting that former mayors Peter Clavelle and Bob Kiss are also included. The accompanying plaque, which Off the Wall members sprayed paint on, provides a legend of people pictured. 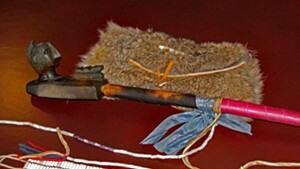 The plaque does not explain the identity of one person depicted wearing Native American garb. Yet the people included are overwhelmingly white. Redmond admits there were “lots and lots of more people we could have added.” In retrospect, he said, he would have included a tribute to the Buffalo Soldiers, a contingent of black military men who were stationed at Fort Ethan Allen in 1909. *Correction, October 9, 2017: A previous version of this story misidentified the muralist, Pierre Hardy.